I'm running an adult lemonade stand. But instead of a folding table squared off on a sun-soaked street corner, it's in my freezer. And to the usual ingredients of citrus, sugar, and water, I've added 151-proof Everclear. That's right my friends, I've started making my own limoncello, and it's a beautiful, beautiful thing. Sean inspired me, the Washington Post (sort of) informed me, and both Berkeley Bowl and BevMo supplied me. Anyway, once I got my transplanted brain around the concept that sunshine-bright fruit hanging heavy on a tree were supposed to evoke scarves, sweaters, and umbrellas, I realized how lucky I was to have lived in four different climates. Because of my unseasonable preconceptions, California citrus in winter means I get a warm sip of summer when the rest of the state is concentrating on sniffling, snotting, and cold-snapping. Being rather short of funds this Christmas, I decided that I would give my local nearest and dearest the gift of bottled sunshine. Considering how soggy our state has become in the last few weeks, this decision was especially prescient of me. Not that we aren't parched for the dousing, mind you, but do we really need the power outages, storm-shattered windows, highway closings, and announcements of hurricane-force winds that just might blow adorable Car off one of our many bridges? Taking Sean's advice with the zesting idea -- instead of paring off the peel from multiple (oh, so many pounds) of lemons -- I used my handy microplane for my Eureka-Meyer combo. However, my beautiful Berkeley Bowl Buddha's Hands proved way too wily for the likes of a modern object, so out came the sharp knives and quite a few hours of careful paring commenced. Those heady, burnished strips were then mixed with the rasped zest of Eurekas because (again taking Sean's advice) I didn't make pure Meyercello or pure Buddhacello. Sean's opinion on the subject is that the 'cellos need the strong backbone of the Eureka lemons to carry them through the thick surf of sugar syrup. After all the maceration and agitation was over, I filled about thirteen pretty 8 1/2-ounce glass bottles, slapped a Grub Report-esque label on them, and handed out my first Lucianovic Limoncello vintage. The Eureka-Meyer combo is fine, it was lemony and sweet and very passable. 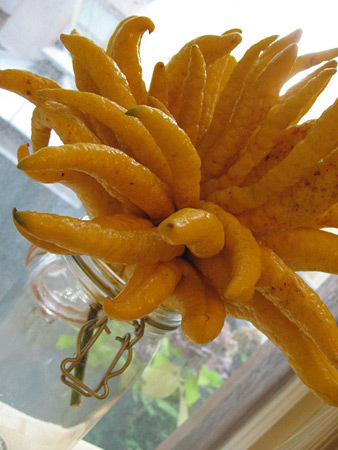 However, the Eureka-Buddha's Hand blows it out of the water with its haunting scent and flavor. The Buddha's Hand batch also has the slightest edge of bewitching bitterness about it -- probably the result of me not getting every bit of the white pith off the zest strips -- which actually balances the heavily sweet concoction quite nicely. One of my first recipients of the Buddha's Hand bottles sent me this text-messaged reaction: "OMG, the limoncello?!? Girl, you've got mad skills!" And this is from a chick who has one of the most sensitive wine, whisky, and bourbon palates I know, so it's a huge compliment. Next up? 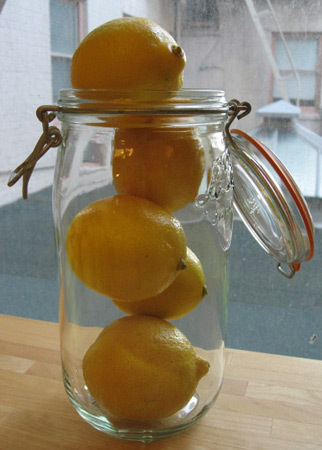 Well, as soon as I'm done preserving lemons in those Le Parfait jars, I'll be experimenting with Grapefruitcello and Ginger-Limoncello.